Want to Be a Kid Again? Now You Can! It seems that a lot of us are trying to recapture our childhoods lately. I think I get it. It’s not just a longing to return to a time of no responsibility, fun and friends. It’s also about returning to a more innocent time, a time when things weren’t quite as complicated for either kids or adults. What exactly that means depends largely on one’s generational membership. The definition of “a simpler time” is bound to be vastly different for millennials than it is for baby boomers. And when it comes to my octogenarian parents, it seems we are talking about something else altogether. My mother cites A Christmas Story and The Book Thief as movies that accurately depict the way kids were treated in the 1930s and 1940s. Elementary school teachers were the schoolmarms of folklore who grabbed you by the collar and yelled in your face and who regularly meted out the punishment of mandating that miscreants write the same sentence over and over again on the blackboard. I have difficulty understanding why anyone would want to return to such treatment, but I do realize that it is a matter of perspective. I suppose it was inevitable that smart entrepreneurs would cash in on the desire to explore our inner child or go back in time to the halcyon days of our youth. Still, I found it a bit jarring when I read an article in The New York Times today about how coloring books for adults are a hot commodity. Scottish illustrator Johanna Basford has released “Secret Garden” and “Enchanted Forest,” the first two in a series of adult coloring books. Her publisher, Laurence King, hasn’t been able to keep them in stock; ample press runs keep getting sold out. I wonder if I should buy stock in Crayola. Adult coloring books are nothing, though. Wait til you hear about… adult pre-school! We refer to the pre-school that my two year old grandniece attends as “day care.” So I’m glad that I (barely) avoided the gaffe of referring to adult pre-school as “adult day care,” which apparently is something else entirely. So if you have money to burn, live in New York City and wish to relive the days of finger paint, show and tell, dress-up and nap time on a hard cot, you can be four years old again in Brooklyn, thanks to Preschool Mastermind, the creation of Michelle Joni Lapidos and her teaching assistant, Miss CanCan (Candice Kilpatrick). It’s too bad that free, universal preschool pretty much runs out its statute of limitations around the age of five. For those of us who exceed that age by a few decades or more, preschool will run you $333 to $999, and that doesn’t even include the cost of such essentials as arts and crafts supplies, snacks and field trips. Apparently, indulging in a second childhood isn’t as cheap as it used to be. Among my grandmother’s extensive storehouse of knowledge was a veritable stock of epigrammatic “sayings” that she could access at will for the edification of dumb little children who happened to be visiting her. These must have had an effect on my father when he was growing up, as he would occasionally resort to one of these bon mots in moments of frustration. One of my favorites was “assume a virtue if you have it not,” which usually meant that Dad was about ready to start cussing. I think the modern equivalent would be something like “fake it til you make it.” It always sounded to me like an instruction to be what someone else wants you to be rather than who you really are. Sleep sure is a funny thing though, isn’t it? There are insomniacs who toss and turn and bemoan the fact that they stay up all night, while borderline narcoleptics, like my father and myself, can be holding a conversation in which the next word is a snore. Children, as we know, require a lot of sleep. And yet, that is the last thing that most of them want to do. Not only is sleep boring when there are so many fun and exciting things to do and explore, but kids intuit that they are missing out on the best times of all by going to bed. We are told that adults, on the other hand, require much less sleep. Then why is it that all we ever want to do is get just a little bit more shuteye? I think what my grandmother meant was that we always think the grass is greener on the other side of the fence. Or maybe she meant that we just like to be contrary. When it comes to sleep, however, it is an inescapable fact that we wish we could return to childhood nights of ten hours of uninterrupted sleep. For many of us, the very thought is nothing short of bliss. Does this mean that, as kids, we want more out of life, and that as adults, we’ve had enough and are willing to settle for less out of life? At some level, I suspect that sleep is an escape not only from the daily grind, but also from all our cares and worries. As I work on my memoir, I find myself summoning up memories of fleeting moments that I never would have expected to remember. For example, I recently recalled a seemingly random moment from a Monday in my tenth grade French class, now decades ago. In an attempt to get our class to practice its skills in conversational French, Mrs. Sawyer (among the finest teachers of any kind whom I have ever encountered) asked us to describe what we did over the weekend. Noting a lack of volunteers, she called on a boy in the back of the classroom, who described how he slept all weekend. “You spent the whole weekend being unconscious? !” exclaimed the disbelieving teacher. And yet, it seems as if we relish our unconsciousness time. Another high school memory of mine involves the time I chose golf as one of my phys ed electives. I liked the idea of it because it didn’t seem particularly strenuous, I didn’t have to change out of my “street clothes,” and, hey, I already knew how to play mini-golf, so how different could it be? I ended up having a rough go of it, however, as I never could seem to hit the ball when I tried to adopt the grip and stance I was taught. When I simply stood back and walloped the thing, however, I was able to drive it clear across the field. When I told my mother about my phys ed elective choice, she approved. “Golf is a life sport,” she informed me. I guess that means that old guys still play golf long after their days of playing football and baseball are over. In the interim forty years, however, I have yet to step onto a golf course. Perhaps sleeping is a life sport, too. If, like my weekend sleeper classmate, you get good at it at a young age, you can continue to enjoy the activity as long as you live. And even afterward, perhaps. I have it on good authority that sleeping is the only hobby in which one can depend on participating even after we shuffle off this mortal coil and spend our days and nights in sweet slumber deep within the welcoming arms of Mother Earth. Alone time does not necessarily imply being without company; it includes time spent with family, friends and colleagues in social and work situations that do not involve one’s spouse. That isn’t to say that a person doesn’t also need some time to be totally alone. Everyone wants some private time to commune with a book, an iPod or a pet. It’s also healthy to have some time to just sit and think, without spouse, children or boss yelling for you from the next room or office. My wife and I seem to have traveled through every possible permutation on the alone/together spectrum during our sixteen years of marriage to date. Well, all but one. We’ve never had to live apart, thank God. I remember my parents doing that when I was a teenager. The demands of their careers took them to different states, so they did the “I’ll visit you this weekend, you visit me next weekend” thing for several years. I was already off to college when most of that occurred, but I know it was hard on my youngest sister. At the time, it didn’t occur to me how this living arrangement was affecting my parents. In the thoughtless way of teenagers, I figured that they chose it, so it’s their problem. I thought about this recently when we learned that a married couple who are friends of ours are considering doing the weekend commute thing to maximize their career opportunities. You just have to wonder whether there’s more to it than meets the eye. Perhaps, like my parents all those years ago, they aren’t getting along with each other as well as they’d like us to think. During the first few years of our marriage, my wife and I each did stints working the graveyard shift at the phone company. Our employer did everything possible to keep spouses off the same shift, so there were a few times when we felt like ships passing in the night. Although we didn’t have a lot of together time, it wasn’t as rough as one might expect. When you work “the grave,” the only thing that really matters is sleep. After several years during which we both worked more normal hours and had evenings and weekends together, I was hired to work in a remote area out in the middle of the desert. My wife left her job to move out there with me, which left her at home alone all day. She knew no one and her family and friends were 600 miles away. We lived in a hick town where there was absolutely nothing to do and the nearest mall or movie theater was an hour and a half away. Unless she went to the grocery store, my wife was stuck at home. She spent a lot of time texting, instant messaging, emailing and Facebooking friends in other parts of the state and country. To make matters worse, my work left me tired and wanting to go to sleep early and catch extra sleep on the weekends. When I arrived home after work on a Friday, I generally wanted only a meal and to commune with the back of my eyelids, which would leave my wife alone some more while I snored. After being alone all week, my wife understandably wanted to get out of town and do something. We did our best to compromise, dividing our weekends between staying home and escaping. After I got laid off from that job, we relocated back to northern California and moved in with my wife’s family. Suddenly, we found ourselves at the opposite end of the spectrum. Instead of being alone all the time, my wife couldn’t escape her family for a minute. As I was unemployed and looking for work for nearly a year, I got to witness this firsthand. We went from missing family to having them on top of us every minute. Alas, in life it is often difficult to find the mythical happy medium. There were a few weekends when we rented a hotel room thirty minutes away just so my wife could escape the constant going and running and doing for someone or other. When we first arrived here, it felt good to be tucked in among extended family; now, we cherish any opportunity for just the two of us to be together. This past week, Pastor Mom went out of town for a couple of days, during which time my wife happened not to have any babysitting duties. She actually had the house to herself and could hear herself think for once. She says the peace and quiet was heavenly. In about two or three months, we plan to move into our own apartment in a location much closer to my work. Not only do we look forward to putting the regimen of commuting behind us, but it will be great for my wife and I to have regular “alone together” time while my wife can have her “alone alone” time during the day. It sounds like marital bliss to me. And if we miss the family, well, they’ll only be about half an hour away. I’m sure we’ll still spend a lot of time with them, but after all the running around, we’ll have a place to which we can escape. A place where we don’t have to remember to lock the bathroom door or watch where we toss our clothes. In other words, we’ll be able to go home. My sister called last night to tell me about a hot job prospect in the Bay Area. She’s hoping she gets the job so that she can move back into her house at the end of the renters’ lease term. I don’t blame her for hoping that her days as a traveling sonographer might be over. Just as she called, I received a text from my cousin on the east coast. This is starting to get freaky. First, my sister, who I often don’t hear from for months, calls me twice in one week. Then my only first cousin, whom I haven’t seen or spoken to since 1996, appears out of nowhere. “Who is this?” I asked when he texted me. I didn’t even recognize the area code. I am guessing that my cousin, who is only two weeks older than I am, is trying to reconnect with family for some reason. Apparently, my brother-in-law in Texas finally accepted a Facebook friend request that my cousin made two years ago. In our younger days, my cousin had a little crush on my Texas sister, but of course nothing came of it since we’re first cousins and all. Instead, he ended up marrying one of her best friends. Putting two and two together, I suppose my Texas sister or her husband gave my cousin the phone number for my Bay Area sister. Then she gave him my number. My cousin and I are such opposites that, from childhood on, we never had much to do with one another. He was always a thin, tall, good-looking guy, while I’ve always been short and obese. I was always well-behaved and did well in school, while my cousin had a sassy mouth, was constantly in trouble and struggled with grades. My earliest memory of my cousin is when, at the age of five, in a fit of pique he took off his shoe and threw it at my grandparents’ console television. I’m sure that a good part of my cousin’s early problems were related to his upbringing. His parents were constantly screaming at each other and, I am told, had fistfights. His father was a skinny little 98 pound guy, while his mother was a huge woman with a huge voice. They both had huge tempers. My parents bought a house in the suburbs and moved us out of New York City when I was six years old, while my cousin slept in the living room of a tiny, roach-infested apartment until he graduated from college. When we were in our early twenties, my cousin bemoaned his bad luck with women and wondered aloud why a fat guy like me always had a girlfriend. I didn’t bother mentioning that personality might have something to do with it. There are not a lot of people who find a wiseass endearing. I haven’t felt the need to keep in contact with my cousin over the years. At some level, I think I associate him with bad childhood memories. So now he gets in touch with me via text and says he wants to call. What can I do? It would be rude to tell him not to call. Maybe I need to give the guy another chance. However, considering that he lives 3,000 miles away, what hope would we have for a normal familial relationship even under the best of circumstances? I texted him back, telling him to call me on the weekend. This should be interesting. In text, I explained to him that I work in state government and that my wife and I enjoy a happy life. “That’s good,” he responded. Then he texted me a photo of himself with his wife. My cousin has always chosen his partners badly. When we were younger, I thought that, because he had difficulties with women, he settled for whatever he could get. First it was his New York wife, my sister’s friend, with whom he had two sons. Then he divorced her and married his New Jersey wife, who referred to him as “my prince.” Then he divorced her and married his North Carolina wife, whom I hear has cancer and is undergoing the hell that is chemotherapy and radiation. My cousin’s mother died of cancer about a dozen years ago, and his father, already past the age of 70, remarried. His new wife suffers from a variety of serious illnesses. Sis is laying bets that, should she pass away, my uncle, now well in his eighties, will marry again. My father says that a second marriage represents the triumph of hope over experience. I wonder what a third marriage represents. After my sister divorced her husband, he stated that he “doesn’t want to die alone” and promptly remarried. Someone should have broken the news to him that we all die alone. Nevertheless, I get it that some people just can’t stand to be without a steady bed partner, particularly after years of marriage. I get it that having lots of family, friends and coworkers isn’t the same thing as having a life partner. Or an until-I-get-divorced-again partner, at any rate. Or maybe my sister is right. Perhaps there really is a marriage gene. Apparently, my nephew is an atheist. My sister informed me of this on the phone this evening, by way of explanation of why her adult son doesn’t want to attend a Passover Seder with her. She says he doesn’t believe in God because he was “raised in science.” I suppose this has something to do with having a father who is a computer engineer and a mother who was a biology major in college and now works in health care. Still, he attended Hebrew school and had one of the coolest bar mitzvahs I have ever attended. When my niece and nephew were kids, I spent countless Passovers and Rosh Hashannahs with them, attending synagogue and eating festive meals. Regardless of how you were raised, I suppose you come to a time in your life when you have to decide matters of conscience for yourself. My mother says my father is an atheist, but Dad denies it. He says he doesn’t believe in an old man with a long white beard throwing down lightning bolts upon sinners, but that he does believe there must be some type of higher power. He just has no idea what that might be. Still, one would be excused for thinking him an atheist, as he claims to loathe religion, which he cites as the cause of most of the world’s problems. One of these days, I’ll have to make a point of asking my nephew whether he’s really an atheist. While having no need to follow the tenets of any faith may seem nominally liberating, I think it must be rather difficult explaining to others the absence of God in one’s life. It’s one thing to have members of other faiths thinking that you’re going to hell for your beliefs. That’s par for the course. When you’re an atheist, however, I would assume that every faith would think you’re a sinner and a lost cause. Of course, there is no need to explain one’s beliefs to anyone. Many people of a variety of faiths or of no faith choose to keep their beliefs to themselves. After all, it’s really no one else’s business. While it is not necessary to believe in God to have your heart in the right place, to do things like helping the less fortunate and being active in one’s community, I find that it does help. Although we all manage to justify whatever it is that we want to do, I suspect that it’s a little harder to stray off the straight and narrow when you know you’re being judged by the Divine and will have to answer to Him. Personally, I find God to be a centering experience in my life, a means of reminding myself of what it’s all about. And while I’ve known too many people without God in their lives who engage in repetitive destructive behaviors, there are plenty of believers who do this as well. At least if I go wrong, I know that I’ll be able to ask God for forgiveness. Real contrition, at least to me, doesn’t happen in a confessional. It happens when you recognize the error of your ways, vow to take a different path, and follow it up with action toward living a more upright life. Among my saddest experiences was the time I encouraged a coworker to attend religious services with me, but he refused due to his believe that God hates gays. He obviously didn’t know God very well. God doesn’t trade in hate, only in love. If a particular house of worship doesn’t want your presence due to your sexual orientation, that means that the hearts of those involved are in the wrong place. It has nothing to do with God. But I can certainly see how those who feel rejected by churchgoers, or who feel that they’ve gotten the raw end of the deal all their lives or who feel that their prayers were never answered might deny the existence of God and consider themselves atheists. Some atheists might believe that I am indulging in self-delusion by placing my faith in God. They may find that believing in God is illogical and fails the test of science. I wonder whether my nephew truly feels this way, or whether he is confusing God with religion. Every religion has certain precepts that might be difficult for the modern man or woman to believe. The faithful have all types of explanations for such things, but I fail to see why one must equate the rejection of dogma with the rejection of God Himself. Ultimately, people come to God (or not) on their own terms. Finding faith often requires just the right combination of life experiences. I hope that, as my nephew makes his way through his young adulthood, he eventually finds his way back to the joy that I associate with faith in God. I’d hate for him to miss out on that. I have sold my hametz. This is a first for me, which makes me laugh because, at my age, you don’t get a lot of firsts anymore. For those unfamiliar with hametz, it is bread and other leavened products that Jewish law prohibits one from eating or even owning during the eight-day festival of Passover, now less than two weeks away. For believers, this is a serious matter, as the Book of Exodus tells us that eating hametz during Passover will cause one to be cut off from the Jewish community. While many in the modern world may scoff, this actually makes sense to me, as there is something unifying in knowing that fellow Jews all around this planet are going hametz-free. It makes me feel a part of something greater, something really big, and this makes me feel good. It fosters a sense of “belonging.” Either you’re a part of it or you’re not. The laws, customs and traditions surrounding hametz are quite involved. I’m sure that it would take years of study to understand them fully, particularly as they apply to the complexities of our American culture. Some things are clear. For example, bread (bagels, tortillas and all that), most baked goods (cakes, pies, cookies, etc. ), pasta and most cereal are hametz and forbidden during Passover. Nearly anything that contains wheat or other grains is off limits because a tiny amount of water could begin the leavening process. If that weren’t enough, Ashkenazic Jews (most American Jews) have a tradition of not eating kitniyot during Passover. This custom is so strong and long-lived that it approaches the force of religious law. What is kitniyot? Essentially, it is rice, corn, beans, peas, peanuts and all their derivatives. This is why Passover is hell on vegans. Go to your cupboard and pick up the first can of food you see. If you check the ingredients, chances are that corn syrup or another corn product is in there somewhere. This is the reason that nearly anything that comes in a can or a box is, if not outright hametz, then likely at least kitniyot. So what do observant Jews eat during Passover? Fresh vegetables and fruit, some dairy products, meat, fish, eggs. 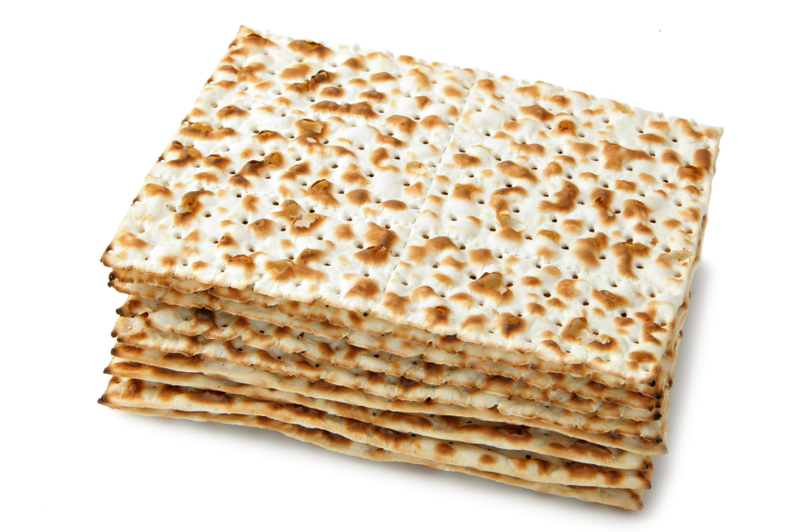 And lots of matzo, the crisp, unleavened Passover flatbread that is something like a very dry, very plain, giant tasteless cracker. Well before Passover, we are supposed to start getting rid of all hametz in our possession. I think of it as a form of spring cleaning. Check out all your kitchen cabinets, shelves and drawers for all those misguided purchases from six months ago that you’re never going to eat. If they’re still good, give them to the poor or to another person who will appreciate them. If they’re expired, in the trash they go. Then there is the matter of crumbs. As anyone who has ever deep cleaned a house knows, they get into everything over the course of a year. Most of us have a tendency to migrate food out of the kitchen: We eat in the living room in front of the TV, we bring snacks into the family room and even into our bedrooms. Chances are, bits of crumbs are to be found nearly everywhere. After we’ve thoroughly vacuumed, swept and mopped, there is a lovely tradition that, right before Passover, we light a candle and walk around the house with it. We use the candle to illuminate every corner where crumbs may be hiding. We carry with us a feather and a wooden spoon for sweeping up even the tiniest bits of hametz crumbs, which we then throw away. It has been decades now since I went about the house with the spoon, feather and candle. I remember doing this as a child, although without the candle, as my parents rightly failed to trust that their klutzy son wouldn’t accidentally burn down their home. Plan A for getting rid of hametz has always been to try to stop buying any and to eat up what you have on hand before Passover. Around the time of the holiday of Purim, in March, observant Jews start thinking about this. How can I use those cans of beans that have been sitting around since December? Hmm, stew it is. But what do you do with what’s left over? As Passover approaches, there’s always some hametz remaining that you forgot about or didn’t manage to eat. You still have half a sack of flour, some boxes of cookies, vinegar, cornstarch, pretzels and a sleeve of saltine crackers. Then there’s that jar of olives and some soy sauce sitting in the back of your refrigerator. You go to Plan B: Give it away, throw it away or sell it. Sell the odds and ends left over in your kitchen cabinets? You read that right. You can sign a document that gives a rabbi permission to sell your remaining hametz to a non-Jew. This is a legal contract that specifies that the buyer agrees to sell the hametz back to you immediately upon the close of the festival of Passover. This is a wonderful device, as it allows one to be “clean” of hametz for the duration of the holiday and still have those food items back for use after Passover. While some view this as nothing short of fraud and artifice, the true beauty of it lies in the fact that even one who makes every effort to get rid of all hametz and needs nothing back after the holiday will unknowingly possess some impermissible crumbs somewhere. Selling the hametz relieves the observant of worry that they are holding onto something that they shouldn’t be. Modern technology has proved to be a help in the quest to get rid of one’s hametz. It is now easy to sell your hametz online. Sites such as www.chabad.org allow you to key in information regarding the possible location of hametz (your home and place of employment) and to give a rabbi permission to sell it for you (and guarantee its return to you at the end of Passover). Some sites even send you a receipt with a confirmation number. Generally, the service is free, with a donation to the organization in an amount of one’s choice encouraged. I wish the internet had been around when I was a child. Back then, you had to sell your hametz the old-fashioned way, by signing a card that contained a brief contractual statement. Of course, a child, lacking legal responsibility, cannot do this. My parents, unfortunately, thought the whole thing was a load of hooey. As they sent me to an Orthodox religious school, this distressed me. When my mother was growing up, any hametz that was to be saved until after Passover was placed into a single cabinet that was tied shut with a string or rope so that it was not accidentally accessed during Passover. My father grew up in a non-religious household where none of this was an issue. When I was a child, however, as Passover approached I would attempt to begin discarding cans and boxes of hametz that I knew we wouldn’t use before the holiday. I remember tossing cans of corn syrup laden Hershey’s chocolate syrup in the trash, only to have them later picked out by my parents, who sternly rebuked me for wasting food that they had paid for. I knew the cause was hopeless. The best I could do was to be very careful so that I did not accidentally eat any hametz during Passover. As long as I was living in my parents’ home, there was no way I could get rid of or sell items that were not Kosher for Passover. The problem was that I was a slob. My bedroom was always a horrible mess, with detritus flung about wide and deep. Once I approached my teenage years, the time of searching for crumbs with a feather and a wooden spoon had long passed. One time, my parents left a brown paper bag full of peanuts amidst the piles on my bedroom floor so that I would find some hametz to get rid of when I performed my search. By the time I was ten or eleven, however, I didn’t bother with such things anymore. The bag sat there, unnoticed, for days. To my horror, I finally came across it when Passover was nearly over.